In a Strange Land: Bringing SL Back to the Conference Room? I'm pleased that VWER will again host Tom Boellstorff, author of Coming of Age in Second Life, and Celia Pearce, author of Communities of Play, will be guests at a special meeting on August 30, 12:30 SLT. To teleport to the venue at Bowling Green State University in SL, click here. Tom was an excellent guest before, and we'll all put questions to him in a voice-chat event hosted by AJ Kelton. I'm reading Pearce's Communities of Play now, and I'm looking forward to the two scholars next project, Ethnography and Virtual Worlds: A Handbook of Method. This time, with two noted scholars and a venue that could be comprehensible to those without avatars, I have offered to show the meeting in one of our conference rooms on campus. 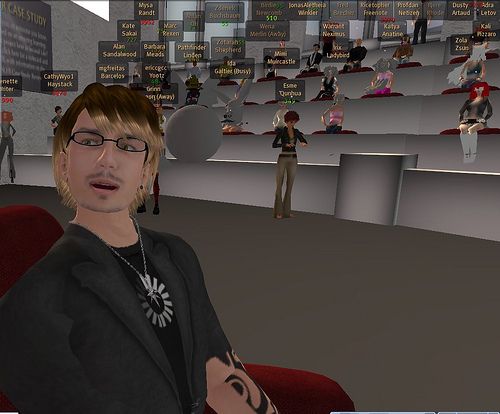 Faculty and staff should then see the potential of virtual worlds for the sorts of meetings that would be hard to arrange and moderate on the fly in real life. Given my experience with conferencing software, I also feel that virtual worlds offer a better venue that encourages less passivity. There is something powerful about embodiment, even as a cartoon character, that gets folks to talk back in a meeting.